It was only a matter of time before someone remade Three Kings. Admittedly, this isn't technically a remake of anything since it's a pretty different story but the concept is the same: a group of military guys break all the rules to make themselves rich. Co-written by Richard Wenk and Luc Besson, American Renegades unfolds in 1995 Bosnia with a team of Navy SEALS who decide they're going to dive into a Bosnian Lake, in the middle of a war, to recover $300 million dollars in gold stolen by the Nazi's during WWII and thought to be submerged in a town which was purposefully flooded. Basically, it's just a lot of backstory to set-up a bunch of military guys trying to get rich during a war. 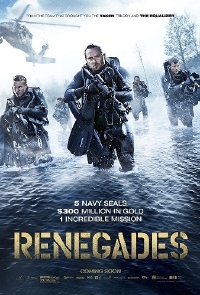 American Renegades stars Sullivan Stapleton, Charlie Bewley and J.K. Simmons who seems happy to chew up the scenery. The fact that what is essentially a heist movie unfolds with the Bosnian war in the background is a little troubling but the trailer is a work of great editing and I found myself totally on board with the movie. The fact it doesn't take itself too seriously certainly helps. American Renegades opens in theatres December 21 with a VOD release to follow on December 25. 3 Kings wasnt the first military heist movie. Kelly's Heroes was decades before 3 Kings. And I'm sure there have been others since. I've just not seen any of them! Could'a swore I've already seen this movie on Netflix (or maybe it was Show Box? ????). It was very entertaining from what I remember.